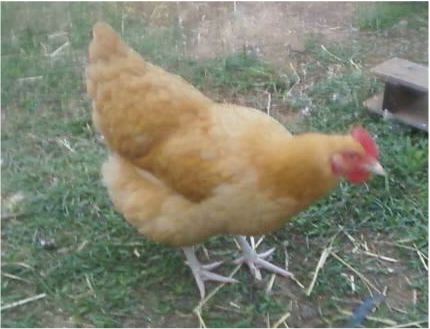 Goldie is a rescued hen at Chicken Heaven On Earth who is the sole survivor of a cat attack. (See pictures and video below). Goldie arrived at Chicken Heaven On Earth on April 28, 2012. How horrific it must have been to be Goldie as she watched as five of her sisters were murdered while she barely escaped. How sad for the little girl whose young hens were found mutilated and dead. We received a phone call saying this little hen named "Goldie" was the sole survivor out of 6 chickens who did not survive the repetitive murderous attacks of a nearby cat. How Goldie managed to survive the vicious predator we were not told. A little girl arrived with her father and sister. She was almost in tears when they arrived but after visiting for a short time and much reassurance that her little chick would be completely safe here at Chicken Heaven On Earth she finally relented and turned Goldie's care over to us saying, "I rather her be here, safe with you than there where the cat will get her" she said with a worried smile. Goldie though slightly skittish at first, which is normal under the circumstances, arrived with a few cat scratches which meant she had a close run in with the cat herself. After a complete physical examination, Goldie appears to be in good health. She will remain in quarantine for 60 days. If she does not show any signs of disease or illness she will be released into a day pen with other chicks around her age group and at night she will stay in a bedroom of the hen house set up for their group. If she does well with them she will be released into the free-range flock of hens which roam on 2 acres and live in the trailer house at night. Right now, Goldie has stolen our hearts and spends most of her time, chattering away, sitting on my shoulder, playing in her room, and day pen. When she gets lonely playing she jumps into the "Dough boy" pen which another group of chicks which were rescued a few days before Goldie. She bosses them around a bit too much so I separate them. When she gets lonely for human companionship she starts chirping and if she does not see me she will come looking, as soon as she locates me she jumps on my shoulder..Goldie has stolen our hearts. This means keeping them in a locked, secure coop at night, and in a completely enclosed run during the day. Goldie has come a long way from the sweet little hen she was when she first arrived, she has laid her first egg and many more. She is now fully accepted by the hens in the hen house and has quickly moved up the ranks becoming one of the favored hens of our elder Queen hens Missy, Betty Joe, Creamy and Gizmo-they all want to sit by Goldie on the roost. Goldie does not take any slack from any of the hens, she knows how to hold her own plus she has now passed her teenage (pullet) stage and is coming into her full rights as a princess of the Chicken Heaven On Earth Queens. Buttercup a beautiful Rhode Island Red Rooster and (lead rooster here at CHOE) has been beguiled by Goldie's shyness toward him and he walks with her everywhere, finding her little bugs and tidbits offering them to her rather than eat them himself. He has been a gentleman with her and we can all see that he is love struck for Goldie. She sits on the roost on the right hand of Buttercup which is a very special place to be. Goldie sits on the right hand and Queen Missy on his left. Hopefully, Goldie will go broody this spring and hatch out a few little Goldie's and Buttercup Jr. Scroll down to see more updates on Goldie. Goldie's first day outside taken on Rev. Penny Dean owner of Chicken Heaven On Earth's cell phone (that's me) and uploaded to Facebook so the little girl who brought Goldie to us could see that she is doing just fine. The video is rather poor quality, taken on a cell phone we think she is too cute for words as she chatters away telling us how much she likes her playpen. Update May 2016-Goldie is an adult Buff Orpington hen now and she has 9 baby chicks which all look just like her (though were not sure how that happened-as her rooster is a Rhode Island Red). We named one of her chicks in honor of Betty Jo one of Chicken Heaven On Earth's oldest and beloved hens (13 years old) who passed away this past Spring. Goldie is Queen of the roost and has truly come into her own as a mother hen. All of her chicks were healthy except one who developed Wry Neck Syndrome and survived. When you purchase items from our website you are helping our rescued birds and animals at Chicken Heaven On Earth. All proceeds go to take care of them.